When the HVPS is in switching mode, it can generate a low voltage (5 V) signal synchronised with with the High Voltage output. This signal is generated on pin 7 (T) of the multifunction 10-pins header located on the HVPS PCB. It can be used for example as a trigger signal to synchronise external equipment on the output of the HVPS, or as a strobe signal to freeze the motion of an actuator connected to the power supply. 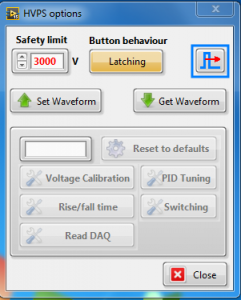 The trigger/strobe pulse can be configured by accessing the strobe option menu from the HVPS options dialogue box (blue square). The position and duration of the strobe pulse are defined as a function of the period of the HV signal. The pulse location is defined between 0 and 1 and represents the position of the trigger/strobe pulse with respect to the HV switching signal. A value of 0 means that the raising edge of the trigger signal is synchronised with the raising edge of the HV signal, and a value of 0.5 means that the raising edge of the trigger signal is synchronised with the falling edge of the HV signal. In the illustration below the location of the trigger pulse is 25%: the raising edge of the trigger pulse is located at the middle of the positive segment of the square signal. The duration of the trigger/strobe signal is defined as a fraction of the HV signal period, as for the position. A value of 0.5 means that the signal stays high for 50% of the duration of the HV signal period. In the example below, the trigger/strobe pulse is 10%. Strobe/trigger pulse. The green curve is the high voltage signal, and the blue dashed line represents the strobe/trigger signal. By default, when the HVPS is powered up, the trigger/strobe pulse defaults to a position of 0 and a duration of 0.5, which means that the signal is mimicking the HV signal. Even though the strobe pulse is configured by default, it is not turned on (see below). Strobe mode (blue rectangle): There are 3 different modes for the trigger/strobe pulse: Off, Fixed, and Sweep. Pressing the button allows changing from one mode to the other. By default, when the HVPS starts up, the Strobe mode is Off. Fixed: the pulse is located at a fixed position defined by the control Pulse Position (see below). If the pulse is used to drive a strobe light, this allows to freeze the motion. Sweep: the pulse position is gradually shifted at a speed defined by the control Sweep speed (see below). If the pulse is used to drive a strobe light, this allows to slow down the apparent motion. Pulse position (green rectangle): This control sets the location of the rising edge of the strobe/trigger pulse (see graph above). The pulse position is defined between 0 and 1 and represents the position of the trigger/strobe pulse with respect to the HV switching signal. A value of 0 means that the raising edge of the trigger signal is synchronised with the raising edge of the HV signal, and a value of 0.5 means that the raising edge of the trigger signal is synchronised with the falling edge of the HV signal. This control is only useful when the strobe mode is set to Fixed (see above). Pulse duration (red rectangle): This control sets the duration of the strobe/trigger pulse. The duration of the trigger/strobe signal is defined as a fraction of the HV signal period, as for the position. A value of 0.5 means that the signal stays high for 50% of the duration of the HV signal period. This control is useful when the Strobe mode is set to Fixed or Sweep. Sweep speed (cyan rectangle): This controls defines the time is takes in ms to shift the strobe pulse along one period of the HV signal. This control is only useful in sweep mode. If the strobe/trigger signal is used to control a stroboscopic light source, using generating a sweeping strobe pulse allows to slow down the apparent motion of an actuator driven by the main signal of the HVPS. A value of 1000 ms means that the apparent frequency of the motion as seen through the stroboscopic illumination will be 1 Hz. The sweep speed must logically be much slower than the period of the main driving signal. This means that no pulse signal will be generated, but a simple change of the strobe mode to Fixed generates a 0-5V signal mimicking the main HV signal with superimposed rising and falling edges. Even if the strobe mode is set to Fixed or Sweep, no pulse will be generated if the HVPS is in a switching mode other than switching (i.e. Off, DC, or Waveform). One of the applications of the strobe/trigger signal is to drive a high power LED for stroboscopic illumination synchronized on the HVPS output. 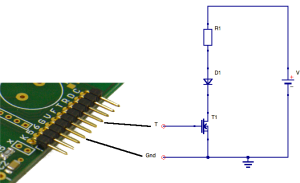 For such an application, the T pin of the HVPS multi-function 10-pins header cannot be used directly to drive the LED. The signal should be connected to an amplification system, such as a transistor. The image below shows how the T output pin of the HVPS can be used to drive a high-power LED for stroboscopic illumination. For stroboscopic illumination, you want to keep the pulse duration as short as possible (typically 5% or less of the total period) in order to freeze the motion. It is therefore necessary to use a high power LED in order to have enough light intensity despite the very low pulse duration. As the pulse duration is defined as a fraction of the total period, the light intensity remains constant when the driving frequency is modified. The video below illustrates the use of the the trigger function for stroboscopic illumination, showing the required manipulations in the GUI.